Pride in Protest's platform, which involves banning New South Wales and Federal Police and the Liberal Party from the parade, has been a source of controversy since the announcement of their candidacy. Update: A previous version of this article inaccurately stated that the member register must have been provided by a candidate, however it has since been rightly pointed out that any person is entitled to a copy of the register under section 173 (1) of the Corporation Act and a member may obtain a copy without charge. A letter circulated to Mardi Gras members has slammed controversial group Pride in Protest a week out from the Mardi Gras board elections. The authors of the letter describe themselves as “a group of former Directors, long time volunteers and concerned members who have extensive experience and knowledge of the inner workings of the organisation”. 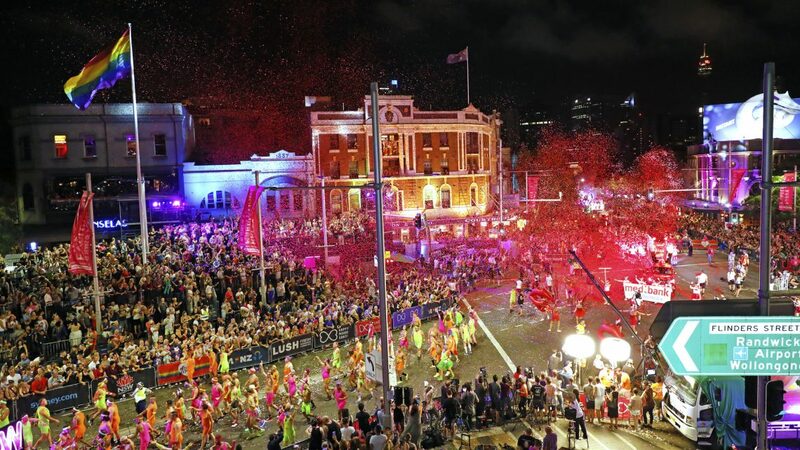 They allege a concerted campaign on the part of Pride in Protest to “seize control” of Sydney Gay and Lesbian Mardi Gras at the forthcoming Annual General Meeting on Saturday 27 October. Pride in Protest’s platform, which involves banning New South Wales and Federal Police and the Liberal Party from the parade, has been a source of controversy. The letter claims that the group have “coordinated and (sic) effective campaign to recruit new members”. 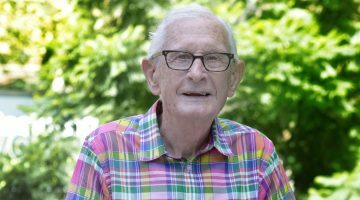 Signed by over 70 people, including two Mardi Gras ’78ers in Frank Barnes and Richard Davies, the list of signatories include a former President and former co-chairs. Pride in Protest has four candidates standing for the board this year – Holly Brooke, Evan Gray, Salem Barrett-Brown, and Kleon Toffetti. Also standing are current directors on the board Jesse Matheson and Kat Dopper, current treasurer Christopher Brooke, as well as Adrian Phoon, Rick Macourt, Louis Hudson, and trans advocate Katherine Wolfgramme. 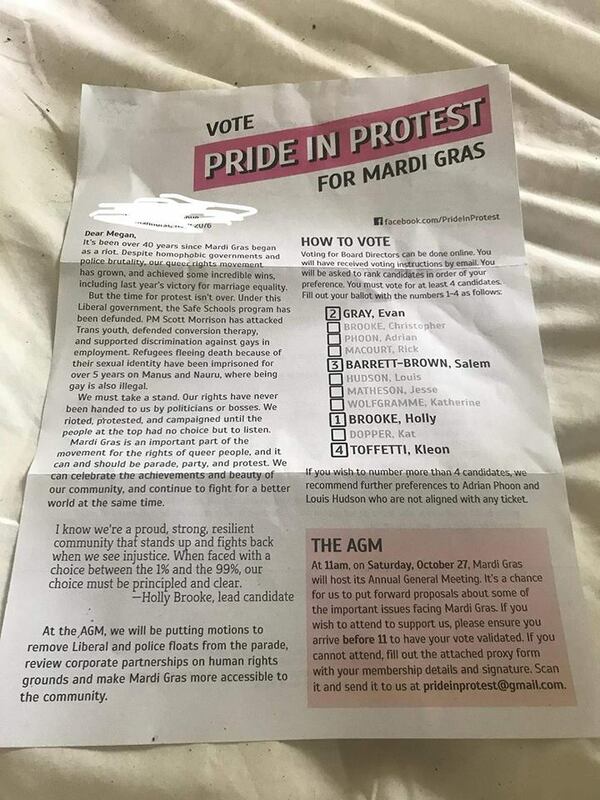 The letter against the Pride in Protest candidates claims that Mardi Gras “was not and never has been a protest organisation”, and urges members to place Pride in Protest candidates either last on the ballot or with no preference allocated. The other name included in the letter is of founding Mardi Gras member and former company secretary Liz Dods. The letter was shared on social media by James Brechney, a former director on the board, who was once called on to resign from the board by Dods as well as former co-chair Paul Savage over Brechney’s description of ex-Prime Minister Malcolm Turnbull as a “dickwad”. Brechney also posted a letter distributed by Pride in Protest outlining their platform and encouraging members to vote for their candidates. 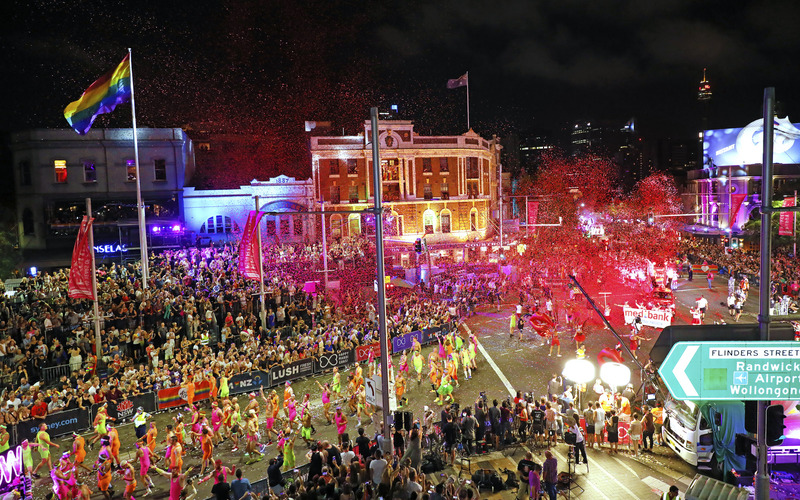 Gray dismissed claims “that if Mardi Gras accepts Pride in Protest’s motions its tax deductibility status will be in jeopardy”, saying that organisations which engage in far more political activity than Mardi Gras enjoy tax exempt status. Gray also noted that Mardi Gras’ tax exemption “certainly wasn’t jeopardised when Mardi Gras chose to exclude Socialist Alliance last year”, and said they were “disappointed in the letter”.